Robert Marsico was a talented catcher from Bedford, Virginia, who was behind the plate for every game the 116th Infantry Regiment Yankees played in the 1943 ETO series. Marsico graduated from Gilmer School in Roanoke, Virginia, before getting a job with the Frank E Brown company treating cowhides. 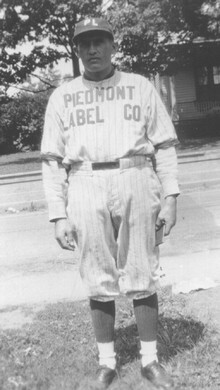 He later helped build the Blue Hills golf course in Roanoke before landing a job with the Piedmont Label Company in Bedford, where he also played for the company baseball team. 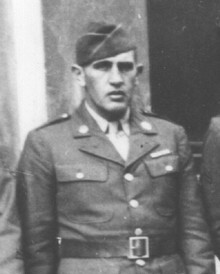 Marsico, who was already a member of the National Guard, was called up early 1942, and served with Company A of the 116th Infantry Regiment, 29th Infantry Division. At Omaha Beach, on D-Day, Marsico suffered injuries to his right arm and leg in the chaos and carnage that resulted in the death of 23 of his Company A comrades. Marsico was hospitalized in England for three months. He spent the next year at a rehabilitation center in Norfolk, Virginia, before being discharged in July 1945. Due to his injuries, Marsico's baseball-playing days were over. He returned to work with the Piedmont Label Company where he remained for 41 years and became an accomplished golfer winning several club tournaments. Robert Marsico passed away in August 1986. He was 77 years old. Thanks to Laura M Burnette for help with her father's biography. Created January 8, 2007. Updated January 9, 2008.